There is nothing too exciting about Grant Field. It was built in the 70's, it's grey, it's small, and time has not treated it kindly. That said, it is still an absolutely wonderful stadium and one that I definitely enjoy. The location of Grant Field is pretty interesting. 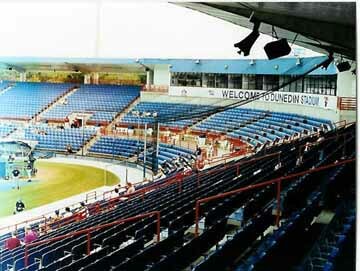 While most stadiums in the Grapefruit League seem to be next to huge empty fields suitable for parking, Grant Field is actually inside of the town of Dunedin and even shares a parking lot with the public library next door. 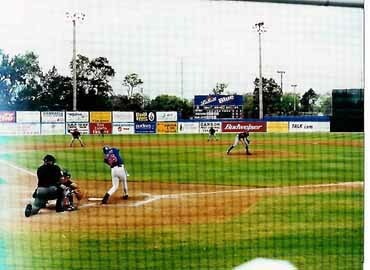 The location of Grant Field conjures of that intimate, home-town feeling that you don't get anywhere else except for Spring Training. You will definitely have a great view from your seats here at Grant Field. The stadium is small, and very few fans show up. There have been times when Indians or Yankees games are totally sold out, but I have no trouble getting seats behind home plate for the Blue Jays. One of the pretty interesting features inside of the stadium is the wall which commermorates "Players from Dunedin to the Show"- all the players who passed through Dunedin on their journey to the big leagues. Blue Jay fans will enjoy this trip down memory lane. The stadium had better than average food and behind the concourse near the concession stands was a tent so that fans could eat their food and be spared from the blistering sun. An interesting feature of Grant Field is that it sells Labat Blue, a Canadian beer, in addition to the American staples. It seemed that the Canadians who had come down to watch their team the loved the stuff, but I didn't see any Americans touching it. 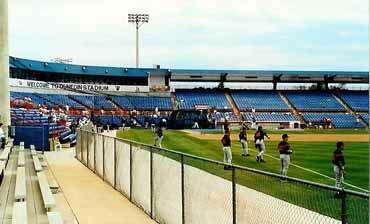 This is a pretty fun little stadium, and although it is not the most attractive stadium in Florida, it is definitely a great place to see a game. View from the very back of the stands at Grant Field. It's smaller than most stadiums. A bleacher section has been added on the right field line, but when I went it was empty. This is the view from my seat at Grant Field- right behind home plate, first row. Autograph tip: Go down to the very end of the left field line. There is a small tunnel area which is accesible to fans and is right next to the path that home team players take to enter the stadium. The Blue Jays were very generous with autographs. When I went, then GM Gord Ash even came out to sign a few. "On the east side of the stadium is the players parking lot. Most, if not all players come in and out of here all day long. There are hardly any auto seekers and most players will sign. When inside the park, go to the visitors side right field section. The seats are cheap at about six dollars, and the makeshift bullpen has only a six-foot chain link fence to hold fans back. Go early and most players will sign. Last years, I got 30 Yankees to sign a bat, and it took me only two days to get it done."